Henri Gray was a pseudonym of Henri Boulanger, born in 1858 in France. (He died in 1924). He used the pseudonym of H. Gray to sign his poster designs. For more racy subject matter, he signed his work with the pseudonym of Orivois (meaning spicy). He began his career designing magazine illustrations and covers. He turned to designing posters during the ‘poster craze’ in Paris during the 1890s. He is particularly known for his bicycle posters. Other poster designers also noted for designing bicycle posters include Jean de Palealogue (who was known as ‘Pal’), Georges Massias, Franciso Tamango and Georges Favre. Boulanger was one of the most prolific of the poster designers; he also created satirical caricatures. Hurtu was one of his regular employers. Hurtu was one of France’s top manufacturers, marketing cars as early as 1896. They were known for superb quality and excellent design, whether in their sewing machines, cycles or autom0biles. This Bicyclette Hurtu has had a first class professional restoration. Every part has been recommissioned to the highest standard – it looks great and it also rides very well (as you can see in the video further down the page). The previous owner found this Hurtu in France in 1995 (coincidentally, its centenary). After its restoration he created the signboard you see here, to use when he took it to cycle displays. The tyre surrounding the signboard is one of its original tyres. In 1867, Jean-Charles-Emile Diligeon, Victor Joseph Hautin and Jacques-Auguste Hurtu pooled their resources to form a company Hurtu, Hautin et Diligeon to manufacture sewing machines. Their machines are of the most ornate design, subsequently becoming the most sought-after by collectors. The company exhibited at the 1889 Exposition Universelle in 1889, held to commemorate the storming of the Bastille a century before. The main symbol of the Fair was the Eiffel Tower, which served as the entrance arch to the Fair. The 1889 fair was built on the Champ de Mars in Paris, which had been the site of the 1867 Exposition, and would be the site of the 1900 Exposition too. The fair marked the first time that visitors were allowed to go onto the yet unfinished Eiffel Tower. Though not yet completed, exhibition attendees were allowed to walk up to the second floor platform. Hurtu cycle posters of the 1890s display a reference to their attendance at this event. The assumption is therefore that they had started making bicycles by 1889, making their debut at the 1889 World’s Fair as cycle constructeurs as well as sewing machine manufacturers. However, as you will observe from the headbadge on my postwar Cyclomoteur Hurtu, a starting date of 1891 is stated. The posters above and below are pre-1895 because the company name is shown as Hurtu, Hautin & Diligeon. Diligeon bought out his partners in 1895 and renamed the company Diligeon et Cie. The Hurtu name was still used for the company’s bicycles, though their advertising posters after 1895 showed the name Diligeon et Cie underneath the Hurtu name (below). The new company built the Leon Bollee tricar under license in 1896, making more of these then Leon Bollée themselves. Four wheel vehicles followed in 1897 with a close copy of the German Benz, a version of which was also made in England by Belsize Motors of Manchester. The company became Compagnie des Auto et Cycles Hurtu in 1899 (below). Hurtu continued their poster campaign into the twentieth century. These days, although most people have never seen a Hurtu bicycle from the 1800s, they are familiar with the company name because of these fabulous posters. Although Hurtu stopped making cars in 1930, the company continued to manufacture bicycles and, postwar, small motorcycles and cyclemotors. Observe the head-badge, which shows a starting date of 1891 for cycle production. With companies themselves not always providing correct information, it’s not easy for researchers two centuries on to find precise facts. 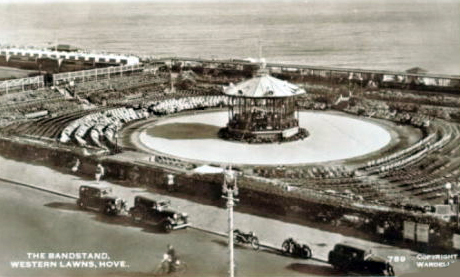 The location of these photos is the Bandstand in Kings Rd, Brighton. 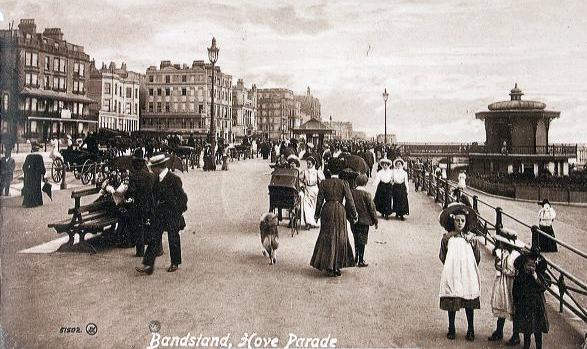 It actually stands on the Lower Esplanade next to the beach, but is raised to the level of King’s Road. This light ironwork building was erected in 1884 with a public convenience in the base. Topped by an oriental dome, the roof is supported by eight delicate ironwork pillars, and there were originally shutters to shelter the performers from the breeze. After its restoration it was re-opened in 2009.